You’ve got your sewing machine and your basic tools. What now? It’s time to choose a fabric for a simple first project. You will want to select something that appeals to you, of course. But it also must be appropriate for your project. For example, if you want to make an apron, you should choose a sturdy cotton for durability as well as for the look it will achieve. But if you are making a pillow case, you will want a soft cotton or linen. You don’t have to know that much about fabric to get started in sewing; just refer to the back of your commercial pattern for fabric suggestions, and ask for help at the fabric store. But you will want to learn fabric if you are going to be a sewer. In fact, basic fabric knowledge is good for anyone, since most of us purchase and wear clothing. So here’s a short introduction to the world of textiles. Fabric fibers fall in one of two broad categories: natural or synthetic. Natural fabrics are cotton, linen, wool, or silk. The rest are synthetics. Some fabrics are made with a combination of natural and synthetic yarns, such as a cotton with polyester added. And some synthetic fibers are made from natural resources; for example, Rayon is a man-made fabric, but the raw material used in the process is natural wood pulp. Generally speaking, natural fibers breathe better than synthetics. For example, a cotton or linen shirt will be much more comfortable in a warm humid climate than a shirt made from polyester, which is a petroleum product. Adding some polyester or other synthetic fiber into a fabric can mean that the fabric wrinkles less easily and is more stain resistant. But this can lessen the breathability of the fabric. Fibers are either woven or knitted into fabric. Woven fabrics do not have stretch to them, unless there has been some knit fibers added to the mix. A small amount of Spandex added to cotton, for example, will keep the basic characteristics of woven cotton with the added benefit of a small amount of stretch. Knit fabrics are made from natural or synthetic fibers, and stretch in varying degrees. Knit fabrics will not ravel when cut like woven fabrics do. The names of common fabrics do not necessarily tell you the fiber content. For example, the term “satin” refers to a type of weave, and it can be made from natural fibers such as silk, or from synthetic fibers that mimic silk. Chambray is, traditionally, a plain weave cotton, but it can be made from a cotton/poly blend. A great way to get familiar with fabrics is to study a good sewing reference guide that has a fabric index. Also, apps are available for your smart phone, which can be quite handy at the fabric store. The one I use is called “Fabric U.” Learning is an ongoing process, since the fabric industry is constantly coming up with new weaves and synthetic processes and fabric finishes. Personally, I lean toward natural fabrics, or synthetics made from natural raw materials, which have breathability. These fibers are usually a joy to sew with, and the pressing process (which is so much a part of the sewing process) is much easier with them. For example, folding and pressing a hem in a cotton is much easier than in a polyester. Natural fibers respond to steam; petroleum-based fibers do not. In order to put a crease in polyester, for example, fibers must actually melt into that position, which makes the crease permanent. No room for mistakes. The top of the bolt that fabric is usually stored on gives essential information. When choosing a fabric at the fabric store, look at the end of the bolt of fabric. The fiber content and washing instructions should be available there. And if you are using a commercial pattern for your project, look at the back of the envelope for “Suggested Fabrics.” It is a good idea to pick something the pattern company recommends while you are learning. 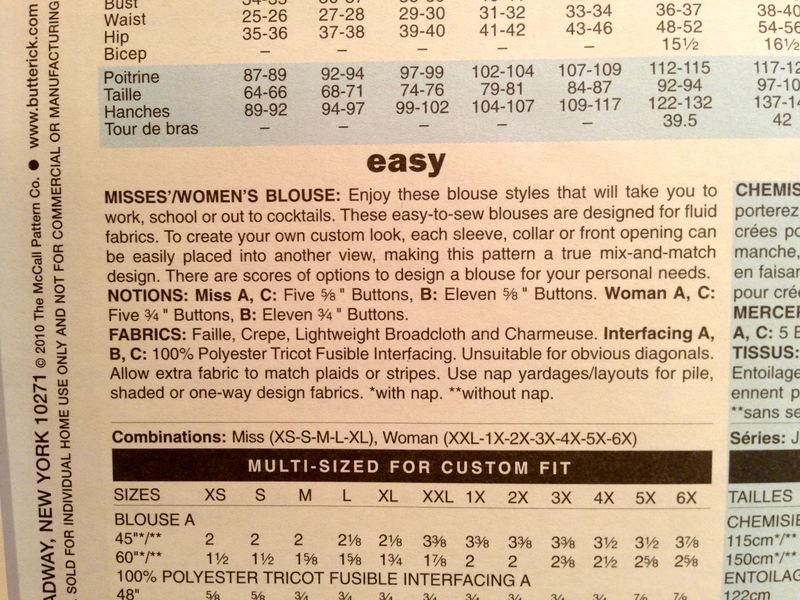 Ask a clerk to show you some of the suggested fabrics. Fabrics come in different widths. Common widths for bolted fabrics are 45″ and 60.” Home decor fabrics are stored on rolls, and are normally 54″ wide. The width of your fabric is very important. 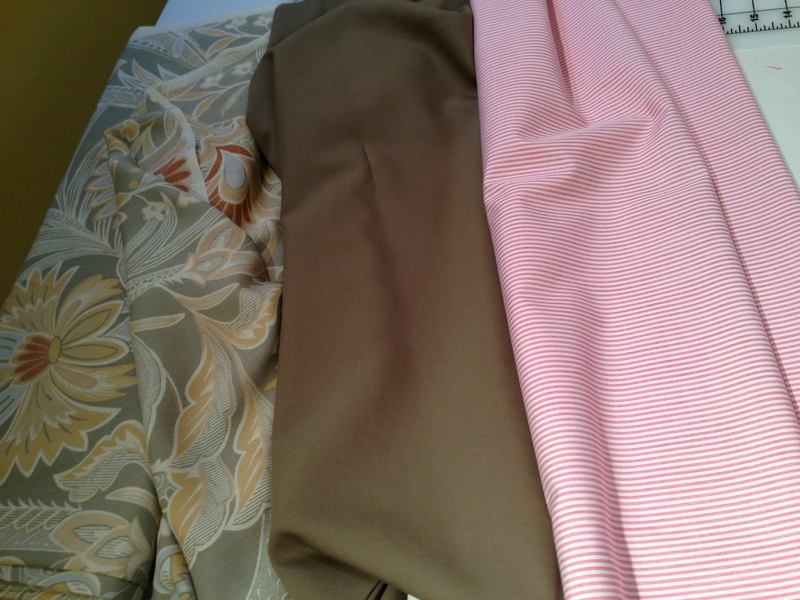 Generally, you will need less yardage for wider fabric, but much depends on the pattern pieces themselves. Refer to the back of a commercial pattern to see how much fabric you need for your project according to the width it comes in. You also need to know if your fabric has a “nap,” or a one-way weave or design. When using fabrics such as velvet and corduroy, pattern pieces must all face the same direction or your project will look like it was made from two different shades of fabric. Also pay attention to the design. Are your birds or flowers all facing one way, or are they turned in various directions? The back of your pattern envelope usually indicates how much fabric you need if your fabric has a nap. If not, add extra to the yardage to make certain you have enough to turn all of your pieces facing the same direction. Before you cut out your pattern, always launder your fabric in the same way your finished project will be laundered, taking note of the manufacturer’s suggested method of cleaning. If you plan to wash the finished product in warm water and then throw it in the dryer, do that now. If it will be dry cleaned, you may want to go ahead and take it to the cleaners now. This will ensure that your project will not shrink later. Once it is dry, your fabric may need some pressing before you pin on your pattern pieces. Your fabric yardage has two cut ends and two selvage ends. The selvage edge of woven fabric is the manufacturer’s edge and will not ravel. Fold your fabric wrong sides together (right side of the fabric out) so that the selvages are together and you have two cut edges. There are times when you would fold your fabric crosswise. For example, if the pattern piece is too wide to fit on your fabric with a lengthwise fold. Your instruction sheet in your pattern envelope will give you this information. Once you have your fabric straightened on one raw end, fold the fabric with the selvage edges together and lay it out smoothly on your cutting surface. You should have a folded side, a selvages side, and two cut ends. Be sure the selvages and your straghtened cut or torn end are even. This process ensures that you will have your fabric grain straight for cutting out your pattern pieces. Join us next time, when we will cut out our pattern. 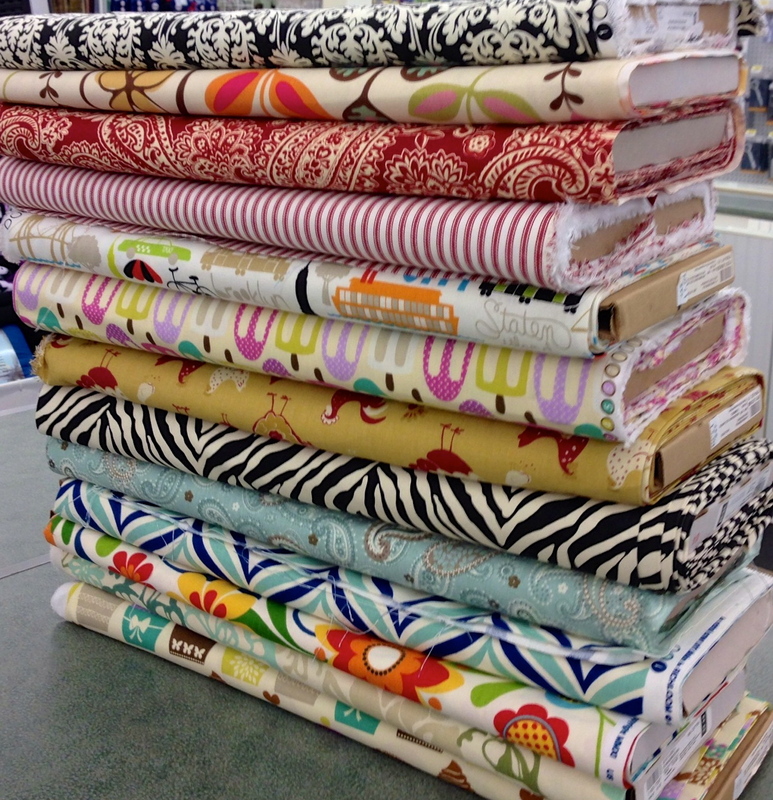 In the meantime, study up on those fabrics!